"Bicycles Also" signs like this should not really be necessary, for a lot of reasons. To my fellow bike commuter this morning at the top of St. Mary’s Hill…southbound on Terrace at around 8:40, Greetings! I love seeing you out there with your bike, helment, riding clothes and backpack with your gear for the office. It’s great, what a lovely morning. But did you have to race through the stop sign past motorists at the other corners of the intersection who had already stopped and were waiting their turn? Did you have to fly past me as I was stopping and engaging in appropriate hand signals that give the motorists the security and peace of mind that I am not about to cut in front of them but instead am going to abide by traffic rules and wait my turn? Did you have to let the motorists go on their way this morning shaking their heads and saying “bike commuters are selfish and unpredictable. ..they’re just not safe.” I think the answer to all those is no, you didn’t have to. You could slow down and behave like a reasonable member of this community of bicyclists, motorists and pedestrians who are sharing the roads of Milwaukee. Next time you ride I hope you will. What a great way to express that everyone should obey the laws. The whole “slow bicycle movement” which is part and parcel part of the Cyclechic movement, leaves room for people riding bikes to fully embrace the laws and stop at stop signs and especially red lights. What’s the hurry? I usually begin with my standard response: “I agree, the world would be a nicer and safer place if everyone obeyed all the traffic laws, bicyclists, pedestrians and motorists too.” That is usually enough to quiet the complainer because I agree that bicycles need to obey the laws, but occasionally I get rebuked and told that people riding bikes “NEVER” stop and they are the real problem, not motorists, they always stop for red lights. Well, since about a third of my work day involves responding to complaints about speeding cars or cars failing to yield to pedestrians, I know that is simply untrue. When we get complaints about speeding, we do a radar speed study and traffic count. 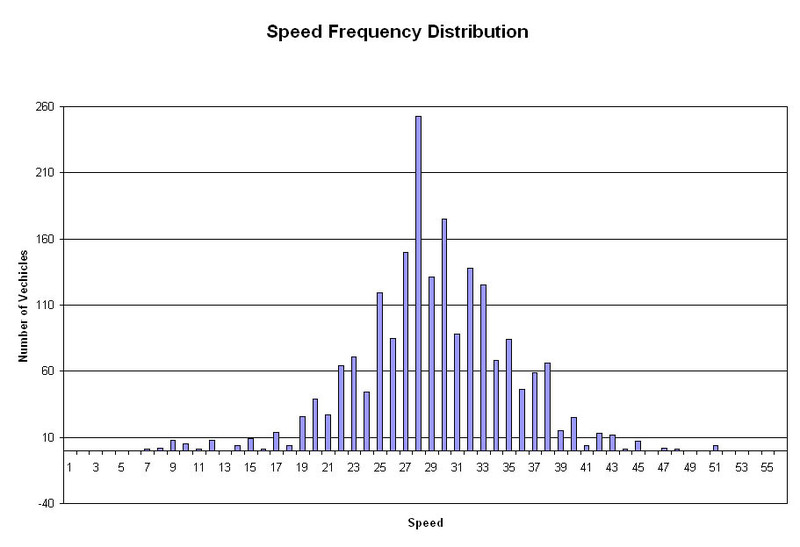 The data typically shows a bell curve of speed over volume centered with the median a few miles per hour above the posted speed limit. That means a little more than 50% of people driving cars disobey the speed limit. Everbody to the right of the 25mph mark in the graph below is breaking the law. But when it comes to yielding to pedestrians in a crosswalk, the number of law breakers is even higher. Even with the bright yellow in-street signs that say “State Law Yield to Pedestrians’” our compliance studies show 95% to 60% of drivers are breaking the law. In my experience, about 50% of people break the laws they can get away with. That means about 50% of people speed when driving cars; 50% of pedestrians walk when it says don’t walk; and 50% of people on bikes blow stops or red lights. That is my belief based on statistics as well as observation at intersections. 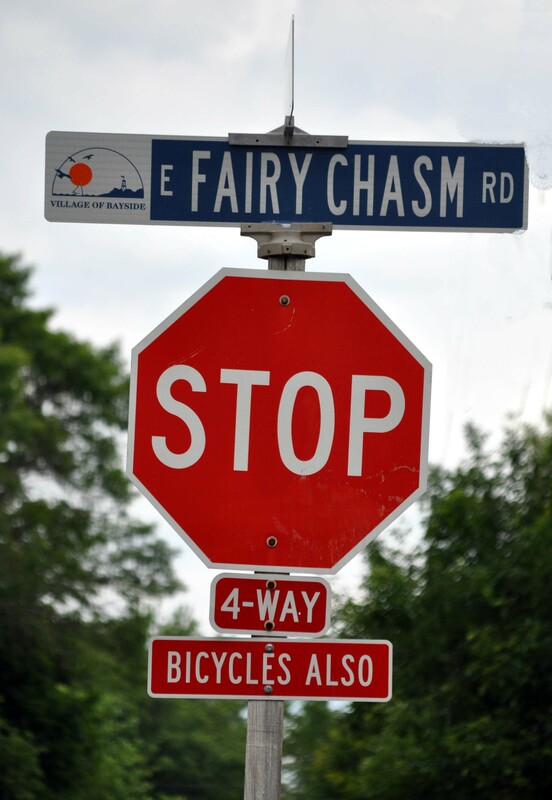 I went to the intersection of Fairy Chasm and Lake Drive in Bayside to watch cars and bikes at the contentious all-way stop there. This is an extremely popular bike route and after many complaints, the Village of Bayside posted “Bikes Also” undter their stop signs. (Note this is not allowed in the MUTCD). Watching and counting for about an hour, I found that 70% of the cars failed to make a complete stop, some never even slowed down. I found that 70% of the people on bikes failed to stop, and some never even slowed down. Now that is greater than my 50% rule of thumb, but I think it is because this is probably an unwarranted all-way stop. I am willing to bet it was put in because of complaints, not because the right-of-way issues warranted it. 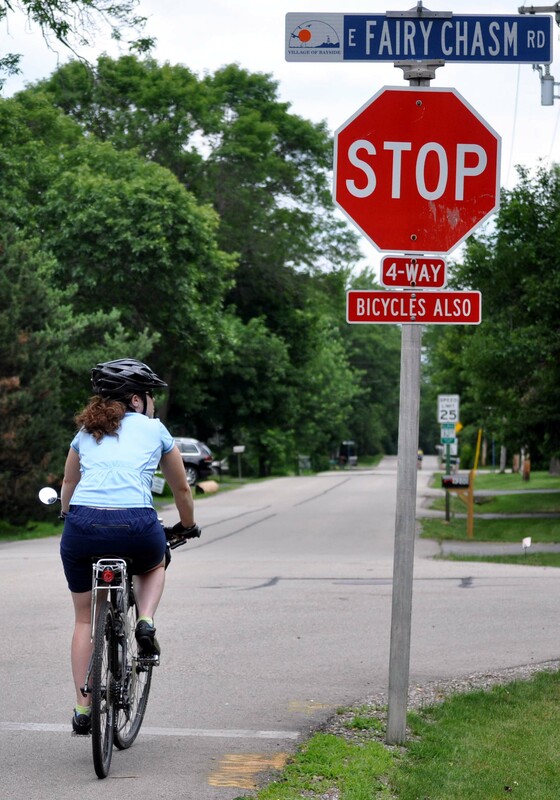 Motorists and cyclists alike are less likely to obey unwarranted stop signs than they are warranted ones. What constitutes a warranted stop? Well the bible of traffic engineers, the Federal Manual of Uniform Traffic Control Devices, allows for engineering judgement but has a number of conditions from number of approaches, approach speed, sight distance, crash history and differences in traffic volume to determine when to put in stop signs. It also clearly states: YIELD or STOP signs should not be used for speed control. Too often though traffic engineers are overruled by elected officials and stop signs are put in after complaints about speeding. All these unwarranted stop signs in neighborhoods across the country have bred contempt for the rules of the road. When I learned to drive a few decades ago, most intersections on local residential streets did not have any stop control or yield sign. These uncontrolled intersections were deemed safe by traffic engineers because only a few hundred cars a day went through them. People were expected to slow down, look and drive carefully. The rules of right of way from the uniform vehicle code were to be followed and everyone would get along fine. But now most intersections have some manner of control, whether it is a yield or a stop sign. So, bottom line is that people are people, whether a person is on a bike, in a car or walking, a significant percentage will break those laws they can get away with that add convenience to their trip. It shortens a car trip to speed. It shortens a bike trip to run red lights or stop signs. It shortens a walking trip if you don’t wait for the walk light. People who ride bikes are no better or worse than people who drive cars in this arena. That said, there are a couple big differences. First, most traffic controls are designed to accomodate cars, not bikes. Signals are timed for cars and bikes often end up hitting red after red. Stop signs are installed because cars speed or crash. Because bicycles are often ignored in traffic engineering, it is understandable that people on bikes may ignore traffic controls like stop signs. Second, when people in cars break laws, they are more likely to kill or hurt an innocent person. A person speeding just 5mph is much more likely to kill someone in a crash than if they were going the speed limit. A person who rides their bike through a red light is most likely to be the victim. But I want to get back to that well written email that started this train of thought. I think we can encourage people who ride bikes to set a higher standard and obey the laws. We already want to encourage more people to ride and one way to do that is to set a shining example as happy, healthy, safe and law abiding people. In keeping with that well written email, lets all slow down, wait for the red light and smile more. I think we will get more out of it than the good will of motorists. I think we will enjoy our rides more as well. If I was flying on my bike in what looks like a speedo, no shirt, headphones around my neck and no helmet I probably wouldn’t slow down either. Nicely put, Dave. Whether I’m in my car or on my bike, it really hacks me off to see a fellow cyclist (or driver, for that matter) brazenly disregard the rules of the road. It makes us all look bad, and it puts people at risk of being injured or inadvertently causing injury. I agree. Although we need to put limited resources where the deaths are occuring, so the tiny amount of safety money there is goes to motor vehicle education and enforcement. Perhaps there is a guerilla marketing way to get the message out to other cyclists. Maybe we could start a Civil Mass Ride where everyone obeys the rules of the road. The issue for cyclists, I think, is loss of momentum and the need to get back up to speed after a stop. I think a common-sense solution to all of this is to do what Utah has done. Utah enacted a state statute that allows cyclists to regard stop signs as yield signs and stop lights as stop signs (i.e., must stop, but then may proceed). If I’m recalling correctly, this was done because their studies showed that allowing bicycles to clear an intersection as quickly as possible actually contributes to overall safety of drivers and cyclists. Agreed, cars use speed to make time. Cyclists want to preserve momentum. I am not a fan of the rolling stop laws for cyclists. I prefer we work to eliminate the unwarranted stop signs first. Once we get rid of those, then reconsider if everyone really needs to stop at a particular sign. I will read that Tim, but I can guess what it says. I am NOT a fan of stop signs. I much prefer neighborhood traffic circles to slow traffic, reduce ROW conficts and crashes. Like it or not, us cyclists are under the microscope. Most drivers roll through stop signs routinely, but if you were to ask them most would say that they come to a complete stop. People vastly overestimate their own driving abilities and adherence to the rules of the road. But when it comes to cyclists every infraction is inflated and elevated to the point where drivers think “every” cyclist blows through red lights and generally acts like a jerk. If only drivers were to behave themselves on the road the same way they demand cyclists behave. We’d all have much safer roads. But since cyclists are perceived as “different” we have different standards of conduct. So I make a big show out of following the rules. I stand there and stop at a red light and wait out the whole light even if there are no cars coming. When there are cars around and I approach a stop sign, I stick my foot out conspicuously to signal that I intend to stop. Interestingly, I frequently get the wrath of motorists BECAUSE I am following the rules. More than a few times I’ve had drivers get mad at me because I lawfully stopped at a four way intersection for their right of way. They get mad because they expect me to blast through the stop sign, and when I do stop I’m apparently “holding things up” by stopping and not just speeding through. What this says to me is that drivers don’t get mad at us because we supposedly don’t follow the rules. They’re mad at us because we’re on bikes. We’re traveling the same public space as cars, but at a different pace. We’re choosing a mode of transport most drivers cannot imagine choosing. We’re perceived as different. If every cyclist were to become a perfect adherent to the road rules, drivers would still be mad at us. But I still stop. Not stopping makes individual motorists angry with individual cyclists, and I want as little angry interaction as possible in my commute. I agree I want to be the best representative cyclist I can be, but I stop at worrying if I am making other people angry. I find I am happier if I just obey the rules rather pick which rules to obey and which not to. I will admit to rolling a few unwarranted stops on empty neighborhood streets. But I always follow the rules when I am in a traffic mix. Bicycles and pedestrians should obey traffic controls, as unnatural and cumbersome as they are. The reason is the danger that cars present. Road rules exist to protect everybody from cars. That’s all there is to it. To illustrate, think of being in a grocery store. With all of that “traffic,” there are no fatalities. Drivers who complain also have to be reminded that the “rules” are in place to protect people from cars and cars from each other. Without the danger of cars, the entire debate would simply vanish. I have to admit that I selectively follow the rules of the road when cycling. I typically follow the law on the heavily travelled street, however in my neighborhood, I look at stop signs as suggestions…. I remember a day not all that long ago when kids ruled the neighborhood streets – they played football, baseball, made bike ramps to jump over each other laying down – and drivers were cautious. Those ugly yellow signs in the middle of the street are actually our most effective sign (next to stop signs). A study in Whitefish Bay showed they increased yield compliance from around 5% to something like 45%. I don’t have the study on my home computer, but I can try to find it at work to confirm the exact numbers. For that reason, they are VERY popular and our only tool to try to get motorists to yield to peds. The police used to do special pedestrian enforcement efforts and target motorist who fail to yield. It was like shooting fish in a barrel. But the reorganization of MPD might not include that anymore. You are correct in that the signs get hit all the time. We are working to develop a system in which we move them around a bit in areas to spread the message to more motorists. But that program is not really organized yet and it is politically difficult to put them in and remove them. As to removing all traffic control, I am a huge fan of that concept. It has worked extremely well in a few towns in Europe. Milwaukee is not quite there yet though. I also remember when city streets were an urban playground. I support that idea still. Traffic has changed though and we may need Woonerf-like concepts to make that happen. I remember waiting for traffic to make a difficult left turn onto KK Avenue (off Russell heading east – near Svens, if you can picture it). Along comes a driver wishing to turn left (KK to Russell) across my desired path. She waived me on and then grew visibly irritated because I declined to move (there was traffic behind her which I felt was not part of this negotiation and I was not in a safe place to accept her generosity). She finally bolted through her left turn with a cranky look at me. Ah, the psychology of the driver. They want their generosity to the bicyclist accepted (nice, and I do waive a thank you when I can accept), but she was unaware of the problem she was creating, allowing traffic to back up behind her, and making me the potential target of any passing driver not aware of me. This situation cannot be cured on the spot. We meet drivers looking after us, and drivers looking for our faults. We’re not all the same; nor are they. There is a fine line between the unspoken negotiations between road users, and one road user directing another. I never like it when someone suggests I go when it is really their turn. That’s pretty common when two arrive at the same time, a draw ensues. On the bike we have a gesture that the driver does not have. I aim my front tire toward the driver’s back wheels, a sort of right turn or a sort of “I am going around behind you” move. That totally always works. This happens to me all the time at the top of Lafayette Hill heading for the bike path behind Alterra to go downtown – I’m pointed east and want to go left down the hill; waiting, sometimes with foot down, sometimes balancing. Left hand out to let the cars behind me know what I’m doing. Cars who are coming up the hill and want to turn left are waiting for me at their stop sign. And the car coming from the west, who has the right of way, the one we’re all waiting for to clear the intersection….stops to give me the right of way because they are trying to be nice. I just wave them on. Can’t really get mad, but it is fairly comical. Stop signS and lights were invented for cars. Period. In the Netherlands and other advanced traffic grids, there are controls that calm small street traffic, as well as signals that are designed and time specifically to address each mode of traffic. In 50 years the USA will still be scratching it’s head about such things.